Irreverent and proudly creative, Bristol takes urban chic to a whole new level. With modern and well equipped venues for corporate events and classically elegant spaces, perfect for weddings, it also has several unusual hidden gems. Bristol is a city shaped by the diverse layers of its long and convoluted history, with inspiring spaces both old and new. 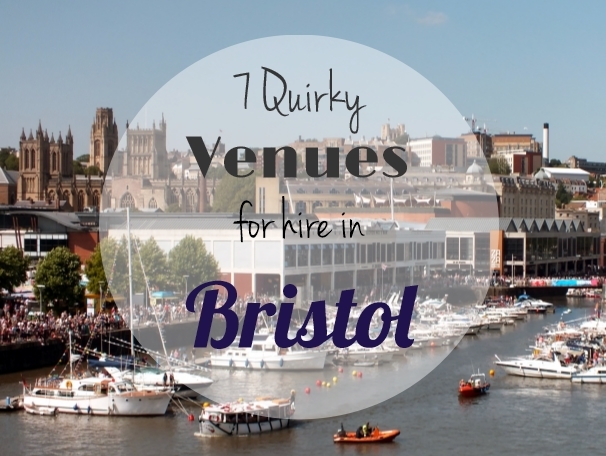 There are so many fascinating spaces, steeped in history or modern and bold, it’s difficult to pick only a handful, but here are 7 quirky venues in Bristol you can hire for your next event. ‘I say, I say, I say, roll up’; bring all the fun-of-the-fair to your event at Circomedia. Occupying the Grade 1 Listed St Paul’s Church, it is home to Britain’s oldest professional circus-school. Set the scene with the spectacular architectural lighting of columns and altar, sound and projection facilities, plus optional ceiling drapes. The venue has two fully equipped bars, catering and a range of flexible spaces, including a chill-out area and the Great Eastern Hall; the newest venue equipped with impressive dual projectors. You can choose from a whole host of aerialists, jugglers, acrobats and walkabout comedy acts to make it a truly unforgettable event experience. ‘To be, or not to be’…how about adding a thespian air to your event? The Tobacco Factory building is one of the few survivors from the great Imperial Tobacco site on Raleigh Road. The architect who saved it from demolition, George Ferguson, became Mayor of Bristol in 2012. This imposing example of industrial elegance, and a pivotal part of the history of the city, is now a multi-use building and one of the most exciting theatre venues in the country. The spaces range from The Snug; a cosy space just off the café bar, to meeting rooms, a mirrored dance studio and theatres. The grandest of which is the main theatre, its semi-circular formation with a central stage – all the surfaces painted black with a pop of red from the rows of seating – create a dramatic venue. 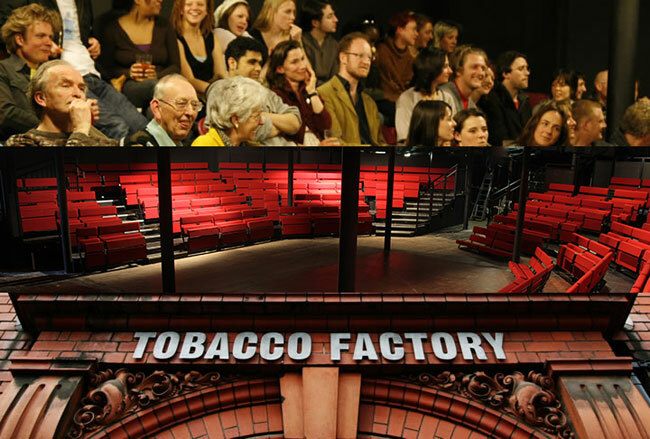 The smaller theatre spaces of the Brewery Theatre, housed in the Bristol Beer Factory opposite, make for an interesting contrast. All the usual conference facilities are available with full catering and bar facilities on site. The selection of beers on the bar is especially good and always fresh, since it’s brewed across the road! 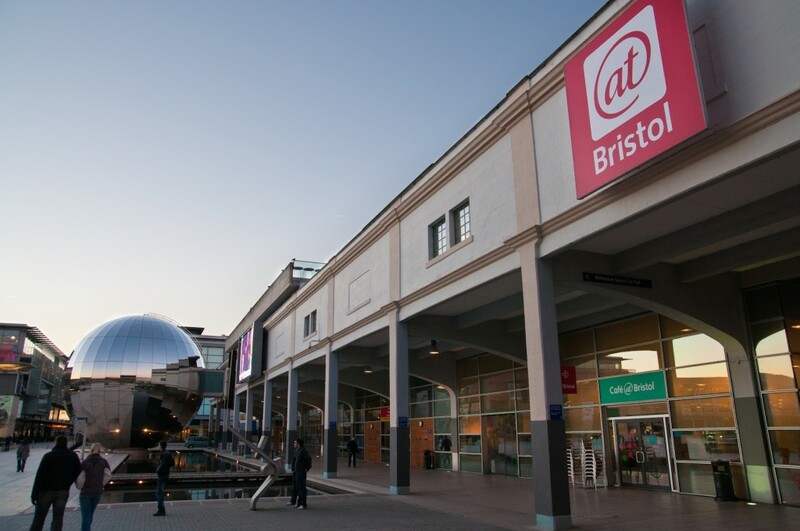 Unleash your inner child at Bristol’s award winning science centre. At-Bristol is an alternative and interactive option for an event with a range of dynamic, versatile and inspiring spaces. As one of the UK’s top science centres, it opened for the Millennium and is the landmark of Millennium Square. It houses an imaginative and exciting hands-on science centre, Aquarium, IMAX cinema, the spectacular chrome-plated dome; the UK’s first 3D Planetarium – all of which are available for hire. There is also a roof terrace with fantastic views of the city, air-conditioned rooms flooded with natural daylight and state of the art conferencing and exhibition facilities. With charitable status, events here also give something back to the community. 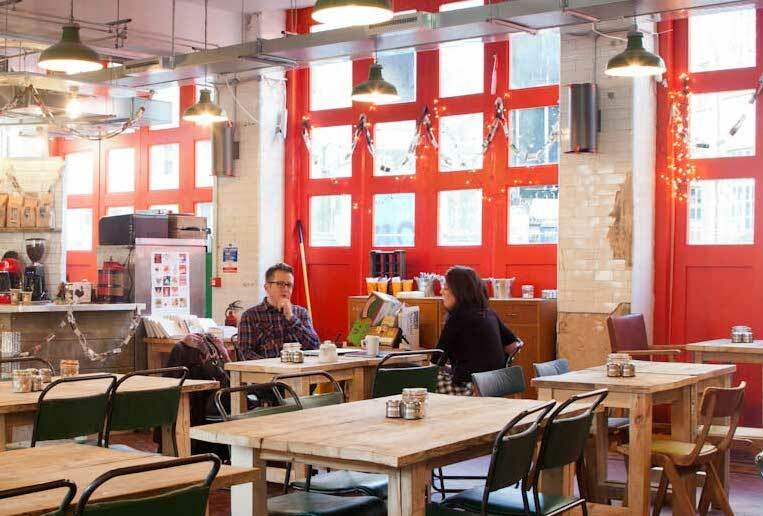 Bristol’s Old Fire Station has been rejuvenated. This Grade II listed building reopened in 2012 as The Station. Owned and run by the Creative Youth Network, it’s more than a youth centre. It houses a café bar, performance spaces, classrooms, dance studios, a professional recording studio and a range of meeting rooms, conference and breakout spaces. Slap bang in the centre of the city, with its vivid giant red doors and buzzy atmosphere, it brings colour and life to a previously run down area of Bristol. 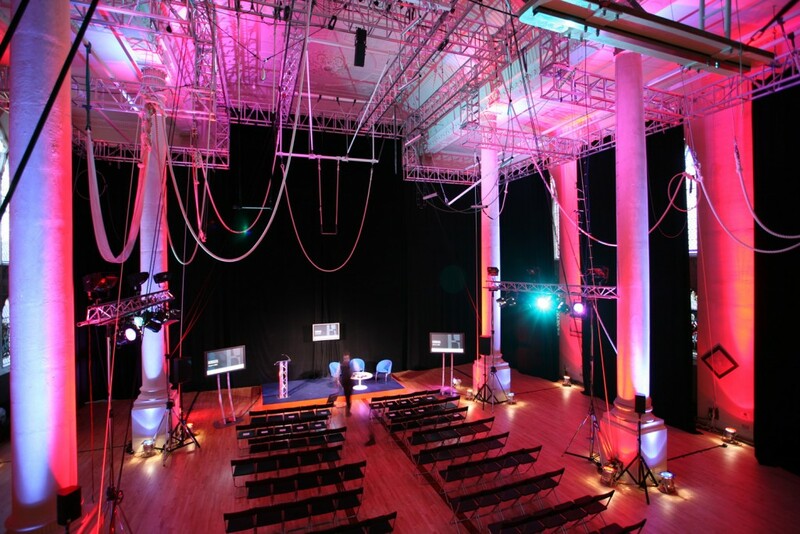 The main space is a large double height hall that benefits from a flexible, portable stage and is kitted out with professional quality sound and lighting systems. The buildings are arranged around a large courtyard so you can take your event into the urban park, a real suntrap. This Edwardian Baroque building has been a landmark in the city since it opened in 1901. Its incredible architecture is sure to leave a lasting impression on your guests. The front hall, Winterstoke Hall, provides a grand entrance foyer – look up to admire the amazing frescoes and glass roof and see the Bristol Boxkite flying above your head. A striking space for a drinks reception and entertainment. 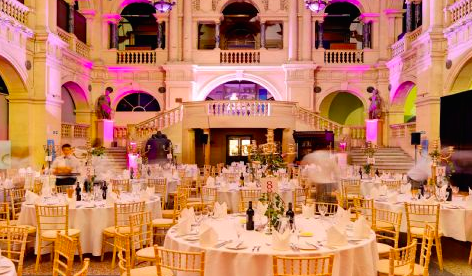 Wills Hall (the rear hall) is the centrepiece of the museum, complete with a grand staircase and chandeliers – ideal for dinners, receptions, product launches, fashion shows and charity events. Both halls boast extravagant vaulted glass ceilings and balconies that give access to the museum galleries. Treat your guests like VIPs with a private gallery viewing. At night, the museum takes on a life of its own. Bring some regency elegance to your event, plus look at mummies, dinosaurs, taxidermy and breath-taking artwork as you mingle with some champagne and canapés in this voluminous and atmospheric space. 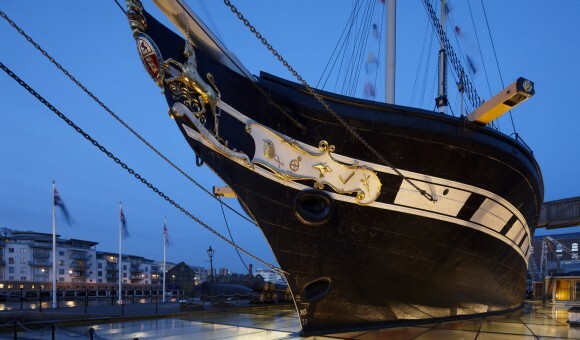 ‘All aboard’ – this majestic piece of British maritime history is not only an award-winning attraction and jewel in Bristol’s crown, it’s also a versatile and fascinating space to host an event. Launched in 1843 as the world’s first luxury liner, the ss Great Britain and the adjacent conferencing spaces, combine to make Brunel’s ss Great Britain a memorable venue. It has a range of state-of-the-art conference facilities, coupled with unusual spaces for drinks receptions, breakout spaces and networking; such as under its hull in the dry dock. During events guests are welcome to explore the ship at their leisure. Step back in time and enjoy the charm of this very special old lady. The former 1950s transit shed, designated ‘M’, gives its name to one of Bristol’s most popular and much loved attractions. Formally the Industrial Museum, this world-class cultural landmark opened in June 2011, with exhibits exploring life and work in the city. In its first year, 700,000 people visited the new museum. Designed to retain its character but with the addition of purpose-built facilities and state of the art lighting and AV equipment. 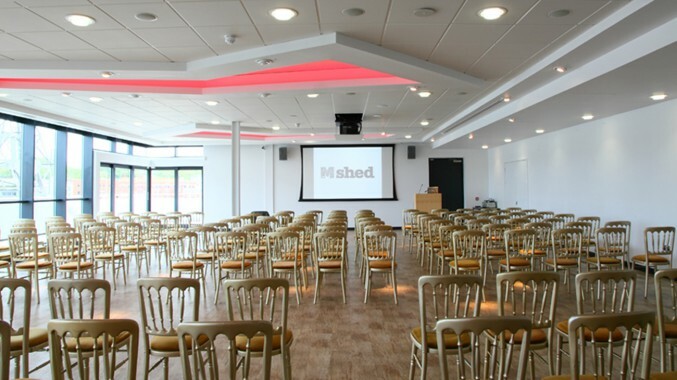 M Shed is set on the harbourside in the heart Bristol and its spaces comprise of the top floor Event Suite which offers a number of room options, as well as the first floor Studios 1 and 2 plus various foyer areas. All feature spectacular panoramic views across the city. The new facilities allow creative adaptation of the spaces for events of all shapes and sizes, all of which can incorporate use of the roof top terrace. Your guests can be honorary Bristollians and find out what makes the city tick in this remarkable landmark of modern city history. This is just a snapshot of some of the amazing spaces Bristol has to offer. Why not consider the gateway to the Southwest as the go to destination for your next event and make it ship shape in true Bristol fashion? Amy Morse is an Author + entrepreneur = Authorpreneur. She writes fiction as Amy C Fitzjohn and has published 3 novels; The Bronze Box (http://bit.ly/Bronze_eBook), Solomon’s Secrets (http://bit.ly/Solomons_eBook) and Gabriel’s Game (http://bit.ly/Gabriels_eBook). Amy is also a freelance Business Coach, providing business skills for creatives in the form of; 1:1 coaching and workshops. She is an avid blogger, engaging public speaker and is passionate about supporting entrepreneurs to follow their dreams. Read Amy’s ‘Adventures in Writing and Entrepreneurship’ blog on her website: www.AmyMorse.co.uk or connect with her on social media.